With version 4.6 of NeoGroup and GroupBuilder it became possible to create multiple versions of the same group. In other words, for a given folder of subjects it became possible to create multiple group pages identified via a 'version'. The different versions can be ordered independantly, selecteively printed in NeoGroup, called onto a NeoPackProfessional template, or used in the Timestone Internet Ordering System. The concept of group versions is perhaps best illustrated by way of example. Consider a school where each class is offered a 'standard' named group. The template used to create this product is 8"x10" and is simply called stdgrp.tgt. 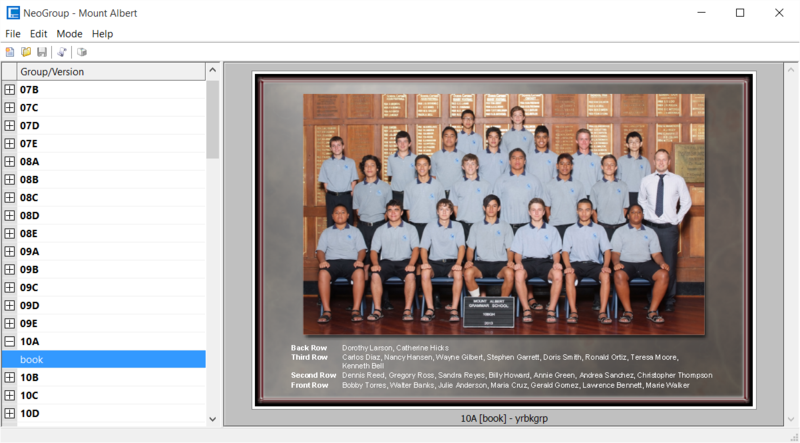 However, for each class, another group is also needed for use in yearbook production. This group is to be only 5"x7" in size and is a completely different design to the standard group. Clearly a second group page needs to be formed and requires a different template - yrbkgrp.tgt. Prior to version 4.6 it was not possible to accomodate this scenario without significant, time consuming, workarounds. However with Version 4.6 the above scenario can be accomodated with group versions. 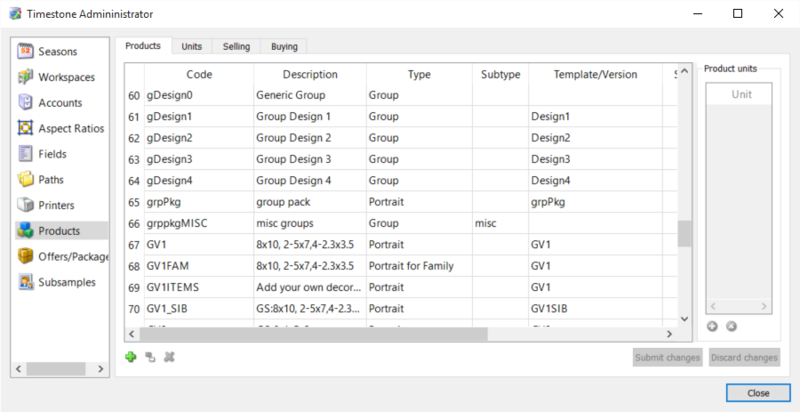 Extra versions for groups are created in the Form Pages Mode of NeoGroup and GroupBuilder. This can be performed at any time although it is most commonly done after names have been assigned in Names Mode. Differnet versions of groups will contain the same names in the names list - it is not posible to change the subjects' rows and positions from version to version (nor does it make sense to do so). However it is possible to format the names differently as described below. As can be seen from the screen grab above, the Group Page Version window performs four functions. 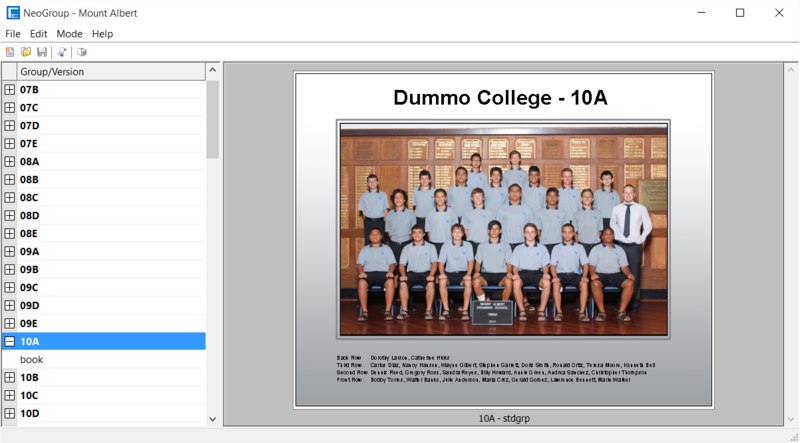 When selecting the default group, the Group Page Version window allows for entry of a subtype rather than a version. Prior to Version 4.6 name formating, when needed, was performed in Names Mode. Since it may be desirable to format names differently in different versions this functionality has been moved to Form Pages Mode and the Group Page Version window. Note the use of prefix and suffix for name formatting remains a function of the name list itself and therefore remains in Names Mode. Prefixes and suffixes can also be used (and not used) in name formatting as described at the end of the article referenced above. 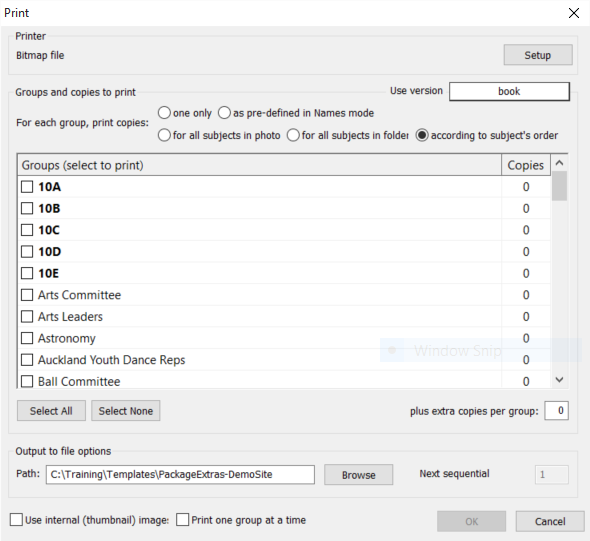 The print window in Version 4.6 of NeoGroup was modified to take into account group versions. 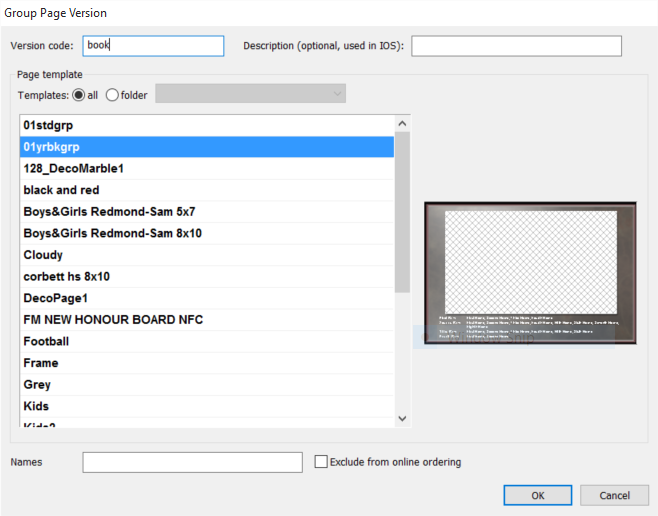 With Version 4.6 of NeoPack now supporting groups (and composites) it is envisaged many people will elect to print groups from within NeoPack rather than NeoGroup. Consider a school where you wish to offer four different group designs - a 'default' design and three other versions , design1, design2 and design3. The subject (paper orders) or customer (IOS) is to be able to order any or all of these designs. Enhancements to the Timestone Administrator (tsAdmin) allows group products to be given a version in the same manner a portrait product is given a Template Key. In fact the same column is used in tsAdmin as can be seen in the screen grab below. Figure 5: The products table in tsAdministrator. Note the first five products - a generic group product and four group products with a version. Since the different group versions are now different products they may be added to an offer and orderd in the normal way. In NeoGroup the group pages are formed for each version and given version codes that match the version code set for the products in tsAdmin. The method above requires additional products to be added to tsAdminsitrator that match the version code given to the group pages in NeoGroup or GroupBuilder. An alternative method is to use a single group product in tsAdministrator. Sticky or non-sticky barcodes can then be used in conjunction with package barcodes to order specific versions. Keyboard order entry via the F3 key can also be used.